Better than some of the reviews have been saying as it was cheerful enough considering it's a town centre kind of boozer. TFA Yakima was an unusual beer to find on. Bar staff nice. I was in here last Saturday pm and unlike JohnPA found the sevice very poor. No one serving but a woman was on a mobile phone behind the bar. 3 other customers waiting too. After a few minutes the woman puts down her phone and starts to serve at the same time as a barman appears. 4 hand pulls with one out of use, 1 for London Pride 1 for Robinsons Trooper. 1 for Jennings Cumberland Ale which i tried and it was ok and cost Â£3.14 a pint. 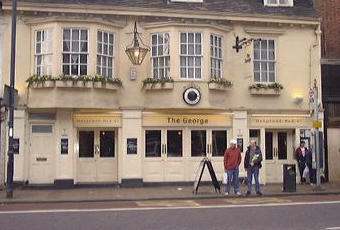 I live in Kingston and work in Twickenham, I often go to The George for lunch as the food and service is the best in the area and it is very reasonably priced. 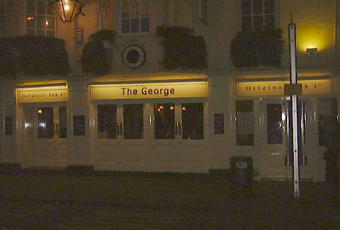 I often come to Twickenham for a night out and always go to the George. There is a good atmosphere in the pub in the day and at night, I have never been in during a football match but I imagine that it is much like any other pub that shows the football. I really do not understand the reviews saying it is chav central if you were in the pub around 5 years ago then yes I would agree however since the current manager has taken over I know he has made a real effort to turn the pub around and he has done an excellent job. 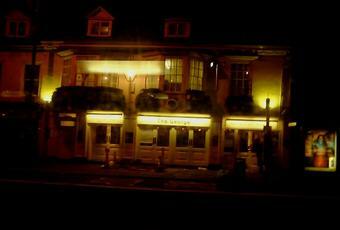 In my opinion this is one of the best pubs in the area and I would recomend it to anyone. recently went there for the man utd/chelsea game atmosphere was brilliant pub was packed like every pub that showed it. And even ran out of glasses and some people had to settle for disgusting plastic glasses (in the afternoon). With reference to the pibull on the roof Angel is the dog in question and never stops barking. Regulary runs out of the cheap beer on a monday its not as bad other posters say nice place to go for a cheap,quiet lunchtime pint in the garden if only angel would shut up apart from that can't think of much wrong with it the management and staff are trying their best.